What is a structural shift of the spine? Anyone who has experienced the pain from a disc herniation knows that the pain can go from zero to unbearable in an instant. It is not only unpleasant, but it can be easy to lose hope that your condition will improve. Your body uses a very similar method to alert you when something is abnormal. Unfortunately we do not have a dashboard with lights to tell us what is wrong, but our body CAN tell us that something is wrong before it becomes absolutely catastrophic. The body will present with a multitude of symptoms to warn us something is abnormal and that we better correct the problem to avoid catastrophe. 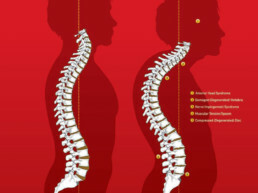 When a Structural Shift occurs in the spine, it commonly appears as a multitude of symptoms. These symptoms or what we call Secondary Conditions, alert you that there is something abnormal with your body. You can look at these secondary conditions as if they are the dashboard lights in your car. When something goes wrong with your car, do you just turn off the dashboard lights? We certainly hope not, and we absolutely would not want you to only correct the Secondary Conditions that you are currently suffering with. Hopefully you want to fix the problem that is causing the dash lights/ Secondary Conditions. That problem could be a Structural Shift of the spine. This is why at Structural Chiropractic we focus on correcting the primary Structural Shift because we know that secondary conditions are typically just like the dash lights in your car. After all conditions are corrected or they have reached maximum medical improvement, we recommend far less frequent visits in order to protect the results you have achieved with your care. This protective care is variable depending on the need of the individual patient.